There are times when you need to do something over and over again on the computer which is very time consuming and tedious. One simple example is the need to transfer a lot of data from an Excel spreadsheet into a database management system (DMBS) and it cannot import the data from the XLS file. Instead of hiring a team of people to do the data input or a programmer to write a custom importer, you can actually rely on a piece of “Macro” software to automatically do it for you. Macro software can be used to create a series of actions to help in automating tasks. It can be as simple as clicking a button to record your keyboard and mouse actions but it can also be very advanced where you get to write your own sophisticated macro script for play back. 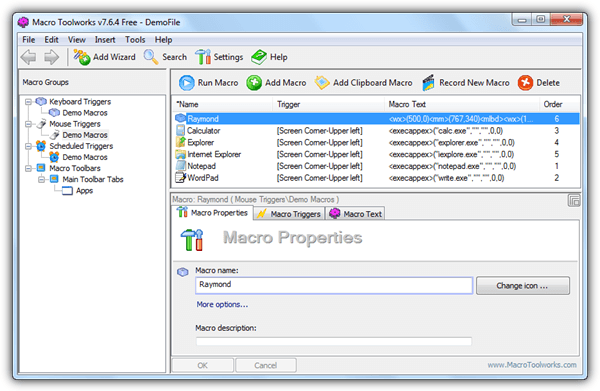 You can find both free and paid macro software, the free macro software is easier to use with less features while the paid versions support more commands and activations. Here we have a list of our top 10 free macro software which can make your computer perform repetitive tasks. Macro Dollar is an old and simple automation software that was originally created around 10 years ago for “paid to surf” programs to click on advertisement bars installed on computers. Since it can record both mouse actions and keyboard input for play back, we consider it to be a Macro software. Probably the most unique yet least used feature found in Macro Dollar is the “Shake” option where your mouse cursor shakes when a recording is being played. The terms used in Macro Dollar are slightly different compared to the rest because this program is created by a Frenchman. For example, the Journal is normally called Macro and the Scenario is actually the Scheduler. WinMacro is nearly as old as Macro Dollar and still worked perfectly when we briefly tested it using Windows 7. 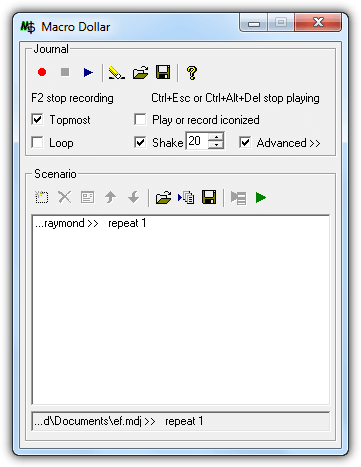 Only 3 steps are required to record; browse the location to save the recording file, click the record button and press the hardcoded hotkey Pause/Break to stop the recording. Whenever you want to play back the recording, simply browse the .log file and click the Playback button. The playback can be cancelled with the hotkey Ctrl+Esc. The Options button allows you to set the number of repetitions and playback speed. GhostMouse is a no-brainer program that is incredibly simple with only 2 buttons (Play & Record) on the main graphical user interface. It is more suitable for quick and short term use but certainly not for automating repetitive task because there is no repeat or loop functionality. One unique feature to be found in GhostMouse is the ability to perform a list of actions such as turning off the computer on playback complete. Do It Again is not much different if compared to the other 3 tools listed above but one advantage it has is the list of macro recordings displayed in the program, making it convenient for users who need to run different tasks without manually loading the scripts to the program. For advanced users, another advantage found in Do It Again is the recordings that are saved as .DIA extension stored in the program’s folder are in clear text format which means you can actually edit the actions. Mini Mouse Macro is an open source macro software hosted at SourceForge. Other than the ability to record mouse & keyboard actions, looping/repeating playback, it also comes with a simple editor to add/remove/edit the captured actions. 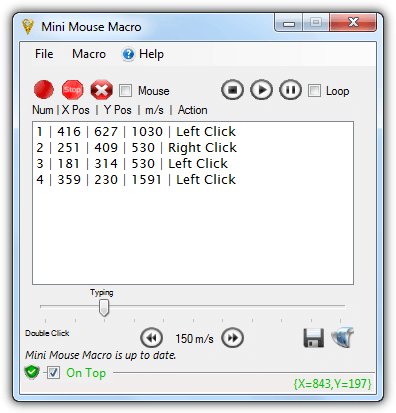 There is a mouse checkbox and once it is ticked, Mini Mouse Macro will include the mouse movement of the X and Y position in the recordings. Defining a loop count is a bit tricky because you’ll need to click on the “Loop” word where a dialog box will be displayed and you can enter the value for the loop count. Command line is also supported and can be easily created from the Script Builder found in File menubar. Macro Toolsworks comes in 3 editions which are free, standard and professional. It is actually a very powerful macro automation software that supports over a hundred macro commands such as variables, finding an image on screen, sending emails, FTP, manipulating windows, etc. However, only basic macro commands such as sending keystrokes and mouse events are enabled in the free version which makes it a pretty basic macro software with an advanced interface. 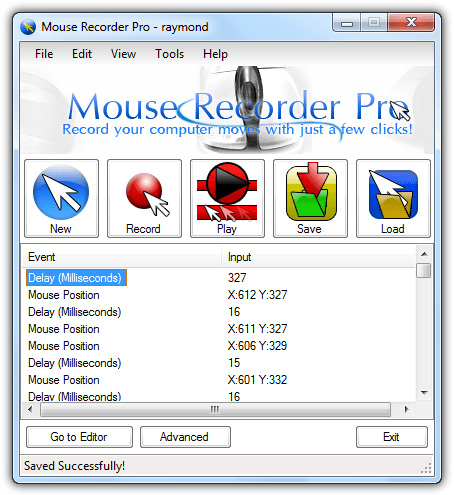 Mouse Recorder Pro is created by a talented young man named Shay from Israel. A quick glance at the software’s interface would make you think that this is yet another simple record and playback macro software but it has much more to offer. Mouse Recorder Pro can be really easy to use, thanks to the 5 big buttons where you can record, play, save and load recordings. Optionally, the built-in macro editor allows you to add or remove events to fine tune the accuracy of the actions. The last update which was released 3 years ago added user plugin support where you can code your own plugins using C# or Visual Basic .Net to manipulate your recording and playing script. You can find our remaining top 3 together with a feature comparison table and summary listed on the second page. Repetitive tasks arise during the day randomly, I need a macro recorder that is continuosly recording and with IA to detect when one task can be repeated automatically. Jurij Fedorov, it is very simple. For example, I will show you how to record the text bellow into the key 1. 1. Execute CMD (command prompt) in administration mode. I need some extremely simple software. I need to write text in the software itself and then when I click a button on my keyboard that text needs to be written. Then I will use 2 buttons for 2 different lines of text. Can’t seem to find this anywhere besides in the $5 Typer MurGee. 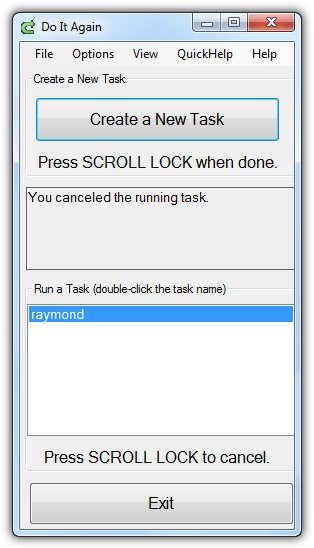 I use AlomWare Actions alomware.com/actions.htm for typing text and moving the mouse, mainly because it also does app launching and window management too (setting windows on top, transparent, and such). Agreed that Anthony Mathews Macromaker is the best of the lot. I used it for years on XP and Win 7 to automate everything except for washing the dishes and flushing the toilet. But does anyone know how to make it work on Win 10? I downloaded MiniMouse. The interface was reasonable but it wouldn’t let me escape playback by pressing Escape. Talk about a DUH feature. It wants instead for me to press Alt+F6. OMG yeah the macro is effing everything up I’ll just take five minutes to look up that… oh nm too late everything is gone. Idiots. I’m a programming and I once programmed a working app that wasn’t so ridiculous. You could make the shortcuts as ANY key you wanted, and why not? I wish I knew what I did with that. Hey James. I’m reading your post and I have to say I totally disagree with you. You say ‘escape’ should be stop…what if I want to record Escape in my macro? So according to you I wouldnt be able to, it would stop recording. With Mini Mouse Macro you can define your keys to stop recording. So say your a ‘programming’, and you have created apps…it sounds like you do not know what you are talking about. Wow, I went through four of these before finding Mouse Recorder Premium 1.0.46. While searching for reviews of Mouse Recorder Pro, I accidentally starting reading reviews for Mouse Recorder Premium. Yes, MPR is free and easy to use. It can do sophisticated other things like finding a certain color or waiting for a web page to load,,, (I don’t use the advanced features) and it actually has step-by-step documentation that got me started right away. Watch the video at mouserecorder.com and I think you will be as surprised as I was. Can anybody advise about the best automation software to open up hundreds of “Load more comments” link on a long reddit post? I use the FREE Clicky Mouse from Macro Toolworks for my enviroment. …and, trust me, I’ve read a bunch. Thank you, Raymond! Once upon a time… Well, I don’t really understand Microsoft. Why does their evolution also mean a mandatory devolution too? Win 3.11 had a macro editor, a clipbook and some other programs and functions that were lost in time… I guess the XP was an accident, they probably fired the team that made it almost fully functional. Since then, every new version is fancyer, but somehow dumber. what happens if you know little or no script language?? Autoit is much more than just a macro generator, it has become a real programming language now. Supporting network communication,dll imports, gui,string manipulation and much more. I have used it for countless projects that had nothing to do with macros, and if you check the forums you can see the true power of this language. MR7, Frank did not reply my email. Can you contact me and give me your username for PowerShadow to generate your serial number?